Mansfield Town captain Lee Collins is hoping to complete a deal this week to enable him to stay at the club for another season. 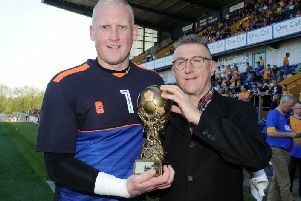 The inspirational Collins won man of the match in yesterday’s final 0-0 home draw with Cambridge United as Stags finished a respectable 12th just a year after almost going down. Collins is one of many players in talks about staying and said: “I am very eager. I am hoping in the next few days to sort something out. “I hope the rest of the squad are here too as we really have a good baton to take into next year. “This dressing room is right up there. I’ve been at clubs where the players don’t bounce off each other as well as we do. We know each other really well on and off the field. “It’s been a very productive season. Personally I have moved clubs and I like to think I have settled well. Collins felt his season got better and better after a false start when injury saw him ruled out of early games and Ryan Tafazolli and Krystian Pearce form a good centre back pairing. He said: “I had to (improve) as I started flat when I couldn’t get in the team. I’d like to think I got a bit of momentum. Like other players, you get a good run of games and really see your true self. On the last day draw with Cambridge, he added: “We made it difficult first half – they had a bigger hold on the game, but second half which really came out and put them on the back foot. “It was a pleasure to watch, finishing the season with a good second half performance.